It’s official: Richard and I are Cheesemakers!!! 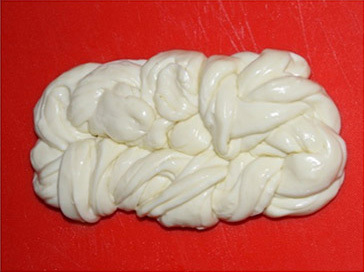 And we discovered that it is actually pretty easy–and VERY fun– to make home made mozzarella cheese. Here’s the back story: My sister got me a cheesemaking kit for Christmas. I was intrigued, but very intimidated. Most of all, I did not want to attempt to make cheese for the first time by myself. So after four and a half months of psyching myself up and bugging Richard to help me make cheese, everything finally came together and we created one creamy, almost buttery good mozzarella. As easy as the directions made it seem, the cheesemaking process was not all smooth sailing. Someone (not naming names!) thought we needed 20 TIMES the amount of rennet we actually needed; luckily we caught that boo-boo before we added the rennet. [Someone’s defense is that he thought the kit came with only enough materials to make one batch which it turns out was not the case at all.] Oh, and if you are the curious type and thinking, “What is rennet? I should google that!”, let me save you some trouble and just say, if you REALLY love cheese, and don’t want to forever taint your affection for cheese, don’t investigate rennet too deeply. It is needed to make cheese, but I wish I could un-know where it comes from. Ok, that is the end of my rennet rant. 1. The proper reading of the thermometer. To be fair, the Centigrade side of the thermometer does reach 120….but there is a big difference between 80 degrees Centigrade and 80 degrees Fahrenheit, so we were also very lucky to catch that early, though Someone also didn’t realize in time that the lines on the thermometer were in 2° intervals so we overshot the temperature at which you add the rennet by a few degrees. Thankfully it didn’t seem to be an issue at the end. 2. Not having a microwave, which is called for in the instructions that came with the kit. The stretching process requires a series of reheatings as the cheese cools rather quickly and takes it stretchiness with it. They provide alternate instructions involving submerging it in the whey that you keep hot. It worked fine but really became a bit of a comedy of errors along the way. Overall, I think the most difficult, or perhaps foreign, part was the kneading and stretching part. First of all the cheese needs to be hot enough for stretching but not too hot to handle. Kneading it seemed to tear the cheese more than anything and initially the attempts at stretching seemed more like pulling it apart. Eventually, though, we got it all coordinated and it became a thing of delicious beauty. Also to note, once it crosses that line into stretchiness it seems to keep on going. As we were twisting it, trying to come up with some kind of final shape, it just kept getting longer and longer. Oddly, there were also a couple of items in the kit that were never used nor even mentioned in the instructions. Not sure whats up with that, but its always weird to end up with extra pieces when you’re done. I would say the entire process, including stopping to take photos along the way, probably only took around an hour. I think most of the issues we had were based around unfamiliarity with the process. Now that we’ve done it once I believe it will go much faster next time. If you are looking to learn a new fun, useful skill, I highly recommend giving cheese making a shot. The kit we used was the Midwest Supplies Quick Mozzarella Kit. You can find it on Amazon which we’ve also linked to on the right side of the post. Of course once we let the cheese cool for a bit it the refrigerator, we had to try it out.. which led to some amazing grilled cheese sandwiches. We’ll post those tomorrow! Greetings! I am one of the West Coast representatives of Cast Iron and Wine, originally from PA, but residing in beautiful Southern California for more than a decade. I am a life-long adventurous eater and cooking enthusiast, and I am fortunate to be located close to a number of farmers' markets, specialty markets, and ethnic grocery stores, where I can almost always find something new (to me!) to try. 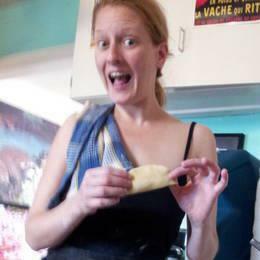 Cooking and creating in the kitchen make me ridiculously happy, and while my creations might not always be a raging success, I always have fun! This might be a great birthday gift for Logan. Thanks! !